Choosing a Breeder What is the Right Breed for Your Lifestyle? Whether you are getting a purebred or "designer dog" . . . . . . . IF YOU ACQUIRE YOUR DOG FROM A RELIABLE, RESPONSIBLE, KNOWLEDGEABLE BREEDER, then you can be more confident in what you are getting. Ask to see both parents, if possible. 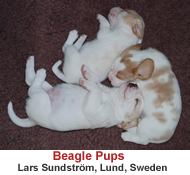 Ask how long the breeder has been breeding and how many different types or breeds of dogs he or she breeds. Be VERY careful about acquiring a dog from a breeder who sells more than three different breeds or who has many litters of puppies available at one time. Don't be shy about asking the breeder for a veterinarian reference. Any reliable breeder will have a regular veterinarian and won't mind your checking with the vet. Take a look around the breeder's house and area where the dogs and puppies are kept. A caring breeder keeps the premises clean and tidy and the dogs and puppies look healthy and bright-eyed. Ask what shots the puppy has had and what kind of health guarantee is given. Most reliable breeders will allow you to take the puppy to the vet of you choice, with a full guarantee/refund within three days if the veterinarian finds something wrong. Don't feel rushed or pushed into buying a puppy. Good breeders want their dogs to go to forever homes where they will be taken care of for life. If the breeder tries to get you to make a hasty decision and you are having second thoughts, then go somewhere else.